The INFOplant system schematically shown below integrates information (data, drawings and documents) related to design, engineering, procurement, construction, commissioning and other downstream activities of any industrial plant. 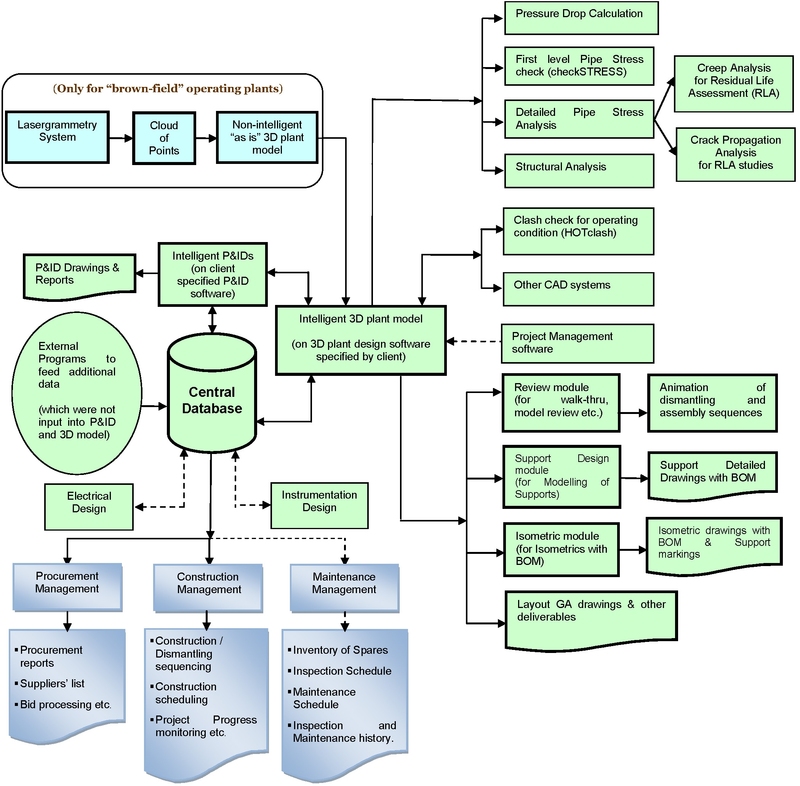 The system consists of a Central Database and various functional software modules that are inter-connected through our "middleware" interfaces (represented by arrows) customized for each plant project. This integration allows the "intelligence" (i.e., attributes) entered at any time for any object in the plant to seamlessly flow to all downstream activities involving that object. For example, a key attribute such as "empty weight" entered for a valve while preparing an Intelligent Piping & Instrumentation Diagram (P&ID) would flow to Intelligent 3D plant model → Analyses software → Project Management tools → Drawing & Report generation modules → Procurement / Construction / Maintenance management systems, without re-entering that attribute ever again. INFOplant works on any Intelligent P&ID module and 3D design software and is customizable for any type of plant. The Central Database can be Oracle, Sybase, MS ACCESS, MS-SQL, etc. All our "middleware" interfaces represented by arrows in this diagram are customized for each project. Prototype versions of Construction Sequencing and Scheduling software are already implemented. Interfaces shown in dotted lines are yet to be developed. HOTclash is available only for PDMS / CADMATIC.